Singapore, 18 March 2015 – In a Singapore first, PacificLight Energy (PLE), the electricity retailing arm of Singapore power company PacificLight Power (PacificLight), and Renewable Energy Corporation (REC), a leading global provider of solar energy solutions, today announced a strategic partnership to offer a new hybrid energy solution, which will encourage electricity consumers in Singapore to adopt solar power as a source of clean and renewable energy. 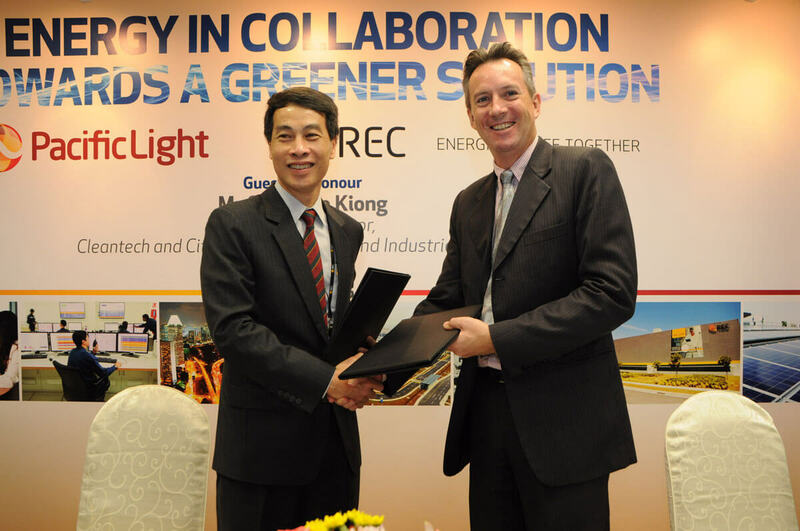 The collaboration between PLE and REC, called the “PLEdge to RECharge Green Energy Program”, will provide customisable solutions for Singapore businesses that incorporate the proportion of solar power best suited to each customer’s energy needs, regardless of roof space. Through these hybrid solutions, customers will be able to reduce energy costs, while also decreasing greenhouse gas emissions and pledging their commitment to environmental sustainability. Under the PLEdge to RECharge Green Energy program, customers can elect an ownership or leasing arrangement model for solar panels provided by REC and the desired proportion of energy generated by the solar panels. The remaining energy requirements will be met by PLE through the provision of natural gas-fired electricity from Singapore’s energy grid. The program has been established in response to the Singapore government’s support for the development and deployment of solar technology as part of its efforts to diversify the nation’s energy mix. It also complements the SolarNova initiative spearheaded by Singapore Economic Development Board (EDB). The program will be introduced for an initial period of two years, during which time PLE and REC will continue to explore innovative ways to encourage companies to adopt green energy and become more energy efficient.